Work is starting on two new visitor coach stops at Derry’s Cross roundabout. The area around the pavements at Derry’s Cross is being re-engineered to provide two dedicated locations for coaches to pick up and drop off passengers. There will also be waiting shelters to ensure passengers have somewhere dry to wait. The Council has contracted Roadform Civil Engineering Limited to carry out the work which has been programmed to run over the school holidays to minimise any impact on traffic. The coach bays will be able to accommodate up to five coaches at any time and have been designed to provide a safe boarding /alighting zone for continental coaches which have the doors on the offside, through the use of new road markings. Whilst scheduled – city to city – coaches provided by National Express, Megabus and the SW Falcon will use the new coach station, other visitor coaches will use this site as well as the existing facilities on the Barbican. The Council worked closely with the trade representative body, the Confederation of Passenger Transport, to make sure both passengers and the coach companies are catered for. Coach parking and driver facilities will be offered on a commercial basis by Citybus and Stagecoach at their depots at Milehouse and The Ride. Work is progressing well on the new coach station at Mayflower Street, which will be operated by National Express. The new coach station will open on 8 September and will replace the one at Bretonside which is closing to enable work on a £42 million leisure complex to start. Currently a few routes have bus stops on the roundabout which I guess will be removed. The other is used as a drop off occasionally. The two bus stop shelters were removed in the last two days and the paved area has been made good. Wow, this looks like a dangerous plan - accidents waiting to happen. You will have passengers from left hand drive coaches alighting into the fast moving traffic on the roundabout, not sure road markings will help them. It will be awkward for the drivers of left hand drive coaches to safely re-enter the traffic. Surely, if part of the roundabout had been removed to allow road realignment a safer haven would have been created for the coaches, the passengers and in fact everyone. Rather than do this, surely the answer would have been to make the new coach hub just a little bit larger to include these drop off bays. But who am I to criticise....let's wait and see how well and how safely it works. this seems a good plan instead off having all the coaches using one area for picking up setting down parking and driver facilities in one place the council spread them over four different areas,put the coach station away from the main bus routes and drop off and pick up areas on a main rounderabout in the city which will not cause any traffic problems?. The other stop is not used 'occasionally'! 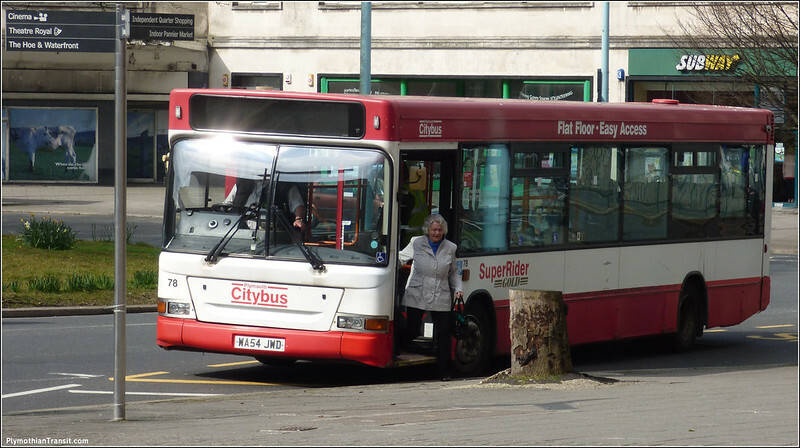 It is used by several Cornish routes and routes 34 and 34A. It is the stop designated by the council for these routes. I note that the Council have not stated where its replacement will be sited. Talking of the SW Falcon, does anyone know how that service is performing in terms of reliability and passenger loadings? There's been a few teething troubles with the coaches. Plus faulty bollards raising up into the underside of 2 coaches. Stagecoach seem on top of the situation now though. As for loadings in my experience, picking up very nicely indeed as word gets around. The coach I was on had a couple of big groups travelling to the airport. Some got on at Exeter, the others at Taunton. And word is it's making a nice bit of money already. I have heard that falcon not doing too bad and is to be extended into Cornwall as far as Newquay later in the year. Newquay Truro Plymouth Exeter to Bristol. It looks like the 2 trees in front of Derry's Department store get chopped down to make room for the new coach lay-by. that would be safer - but pretty sure its just road markings I am afraid. I dont think its anything unsual though as passengers on European coaches will be getting out on the wrong side most places they visit over here. As Graham says it's probably not unusual for European coaches to have to set passengers down on the wrong side over here, but how many places they visit will it be on a very busy roundabout like Derrys Cross. I suppose they could and maybe should use the door on the opposite side, if fitted. This plan may appear to look ok on paper, but in practice is probably very dangerous. An ill conceived plan, anyone who has witnessed passengers alighting from left hand drive coaches in Bretonside bus station will know how dangerous the roundabout is likely to become. The passengers certainly do not keep to the designated marked yellow path provided for alighting from left hand drive coaches. Mistake after mistake after mistake, when is this nonsense going to end! I suppose one day the council will call in "outside consultants" and they will recommend the building of a "proper bus and coach station. They tell me there is a large empty site between the main shopping area and the Barbican! well its empty at the moment - but not much longer! For visitors coming to Plymouth, maybe for the first time, it is a pretty depressing sight which will greet them when they get off their coaches - closed shops, including an empty department store - not that Bretonside was very inspiring in its declining years. Could not room have been made at the new coach station by having bays in the bottom half of that site? At least then visitors would be able to walk out on to Armada Way which would be a much better introduction to the city - and have better shelter than at Derry's Cross. They are not going to be able to build shelters for 100 or 150 people there. The trouble is that, with the opening of Drake Circus, the city centre has effectively moved and the 'quality' retail is now all on that side of Armada Way. The advantage Bretonside had, as did Paris Street in Exeter, was that it was right in the city centre. I am sure the City Council would like to reinvigorate the west end of the centre, but short of getting an anchor store like John Lewis to come into the old Co-op building, it is hard to see, in an age of declining High Street retail, what they can do. I would not have thought the BHS premises would be big enough for John Lewis - if you look at the size of their store in Exeter (ex-Debenhams, ex-Bobby's), you would be hard pressed to find that sort of store area in Plymouth. The Co-op (Derry's) building comes closest - but is now at the 'wrong end of town', unless there is a plan to regenerate that whole area for retail. As Anon said, WH Smith's is now a bit out on a limb - although it is no longer the company it was - and could take at least some of the BHS store site. If John Lewis are planning to go west of Exeter, they might find Truro more attractive. What's the CCC? The Civic Centre? It can't be demolished as it's a listed building. Good to hear Derriford is progressing well. A citaro is covering for 107 on the BlueFlash which was bumped a few weeks ago by a car.